This page lists various resources about open technology, open-source and education,with the most recently added at the top. I plan to tag the articles via my del.icio.us links as time permits. 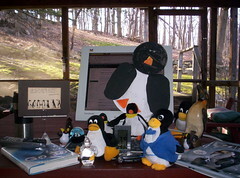 Essays of Early History of Open Source, and Softpanorama Linus Torvalds’ Interviews Collection. Moodle: a case study in sustainability from OSSWatch in the U.K.
distributed e-learning programme, includes a link to a study (PDF) on sustainability of Open-Source models.